Richard Crespin is the Executive Director of the Corporate Responsibility Officers Association and the President of SharedXpertise Media, publishers of Corporate Responsibility Magazine. As the professional society for corporate responsibility executives, the CROA accelerates the profession of corporate responsibility. CROA members transform ideas into action, advancing corporate responsibility (CR), the profession, and their careers. CROA members get the full picture of CR's potential. As the largest independent CR community, CROA was founded on the concept that to excel in corporate responsibility, organizations need to embrace all CR disciplines: sustainability, best practices in governance, social responsibility, and philanthropy. In addition to serving as the CROA's Executive Director, Mr. Crespin also serves as President of SharedXpertise Media, the publishers of the Corporate Responsibility Magazine and the organizers of the COMMIT!Forum. CR Magazine is most well known for publishing the 100 Best Corporate Citizens List, a compilation of the most transparent and accountable publicly traded firms in the United States. The COMMIT!Forum calls on organizations to make specific commitments to change the world. Through CR Magazine and the COMMIT!Forum SharedXpertise shines a light on how businesses can maximize their positive impact while minimizing or eliminating the negative. In previous roles, Mr. Crespin has worked with some of the largest finance and logistics enterprises in the world, including the world's largest supply chain organization, the US Transportation Command, and for several large multinational banks. Before coming to SharedXpertise, he founded The Delve Group, Inc, a premier market research firm. He also worked for American Management Systems where he headed the company's Defense Strategy Consulting Practice. 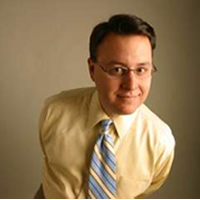 Mr. Crespin is an alumnus of both the George Washington University and the Harvard Business School. He recently served as Immediate Past President of the George Washington Alumni Association, with responsibility for the University's 225,000 living alumni around the world. He is a sought after speaker on corporate responsibility, business ethics, and employee engagement. He is also a regular blogger for Forbes.com. He lives in Falls Church with his wife Emily where they enjoy trying their hands at "extreme parenting" with their three young children. You can learn more about SharedXpertise at www.sharedxpertise.com and the CROA at www.croassociation.org.